This winter is supposed to be a big weather winter for the state of California. After a record drought, this is going to be the winter that takes the edge off. Basically we are going to get a bunch of rain. At least that is what the weather forecasters are saying, but who knows about those people. They are basically telling us the future and is that really possible? We’ll just have to wait and see! But in preparation for all this rain our housing community has been putting on El Nino preparation workshops- which really means they are telling us our house is going to flood and we should be prepared. Pretty smart of them, and I’m thankful that I have some prep time but I’m not looking forward to that! I’ve never experienced a natural disaster be it a flood, hurricane, tornado, fire, or earthquake (that last is probably surprising because I live in California but it’s true!). I just know they are devastating. I could try to write and say it’s a chance to rebuild but that would be really lame because until you’re in that type of situation you just can’t know what it’s like to lose everything. So we are getting prepared. We have our kitty cat carriers prepped and ready, shot records easily accessible, emergency clothing bag packed, documents sealed in fireproof box, and pictures saved to multiple devices. And because I have the most amazing wife in the world (sorry but that is true and I will leg wrestle anyone into admitting as much who thinks differently!) she has rented a storage unit way up on top of a hill specifically for all my books (remember I am old school and haven’t gotten to the age of e-books yet). She’s even packing them up for me! What makes her so amazing is that she knows how much I love my books. I mean I could live without them but its taken years to accumulate this collection- some of them aren’t even in print anymore. I have books that were published by companies that no longer exist. Books that are first editions. Books with the most awesome cover art simply because of how much it reflects the time period it was published. Books from authors who have passed or who are no longer writing. And I have books that I turn to for specific moods like when I want a laugh or to be transported to another world or when I just want to escape to the perfect romance. Knowing they are going to be there after this winter of rain, flood and un-California like conditions makes me feel a lot better. Are you prepared? What if we played the game if you were stuck on a deserted island and could only bring three books with you (e-book readers stocked with books does not count as one book for all you sneaky types! ), what three lesfic books would you choose? Which stories are your go-to re-read titles in the lesfic genre? Of course there are rules or just one rule- as in you can’t name a series and expect all 2-however many books to count as one. I’ll start! 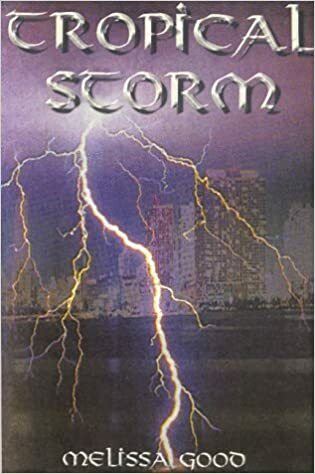 I think one of my choices would be Tropical Storm (Dar and Kerry book 1) by Melissa Goode. This has definite length which I love! I can get lost in the story, bond with the characters and not have that fear soon after I start it that the next page I turn is going to be the last one. The Dar and Kerry are fun and provide a nod to how I got caught up in lesfic to start with- xena fanfic. The copy I own has drawings in it, and to be honest when I first bought the story I had no idea that fanfic existed so kept wondering who the drawings resembled because, darn it, they looked so familiar! I know- I should probably have my card revoked. 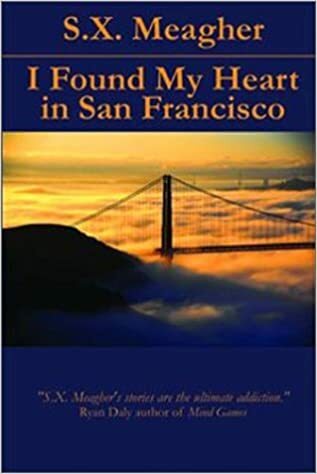 My second story would be I Found My Heart in San Francisco by Susan X Meagher. As mentioned above I have some original first prints and this is one of them. I know that she has continued this series, but I feel like I got the notice late. When I checked amazon I think I saw book #19 which is totally awesome! but the original story that I read had an ending. Granted they hadn’t completed the AIDS LifeCycle yet (you can follow my ride prep on my FaceBook page!) but they had consummated their relationship. I was pretty confused when I picked up the second in the series called Beginnings and Jaime and Ryan haven’t gotten that far in their relationship! Still, this book would be in my pile of three because I think it has two very sweet characters that make each other better throughout the story. 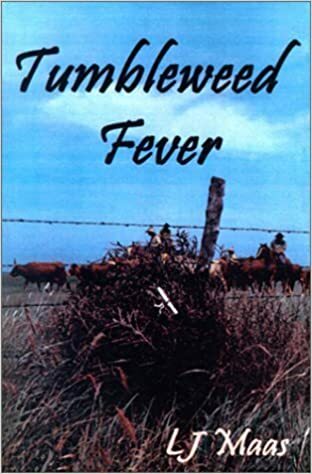 My last choice would be Tumbleweed Fever by L.J. Maas. This story has it all! Cowboys, love notes, old western shoot-outs and the absolutely most romantic build-up to a first kiss yet! Devlin wooing Sarah or is it Sarah wooing Devlin? It’s a wonderful mix of action, love, xenaness and page turning story telling that makes L.J. Maas one of my favorite authors. Now you? What are your three lesfic titles for your deserted island entertainment? Well, I’m not in Callifornia. Here, they’re telling us it’s gonna snow a lot, so far, we’re only having a little of it today. Corikane that is so awesome because I was debating between None So Blind and Tumbleweed Fever! Excellent choice on that one. I just finished reading The House on Sandstone over the holidays and can definitely see why that would be in a re-read pile. Enjoy all that snow when it comes! Give Me A Reason – Lyn Gardner. Kim- Curious Wine was one of my firsts as well. Sort of solidified the whole this-is-a-real-genre for me! I haven’t had a chance to read your other two selections but I’ll have to check them out. Thanks for reading! It was a tough question wasn’t it? I only finalized my answer because my wife said I had five minutes and then needed to be in bed! Robin Alexander and Ann McMan are excellent comedic writers so I could see your deserted island experience being a fun one with lots of laughs! I haven’t read either of those titles though so I’ll be checking those out! Thanks for reading!! Third book is a tie between: Loved and Lost by Stephanie Kusiak, An Infatuation by Jennifer Lyndon, Terminal Event by Ali Spooner, Positive Lightning by Laurie Salzer, and Secret Lies by Amy Dunne. That’s not fair! You totally cheated Ted!! LOL! I’ll be checking out some of the titles you listed for sure! Thanks for reading!! cw- I would definitely be crashing your deserted island! Though randomly I haven’t read your third place tie. Hmmm…have to add those to my wish list as well! Thanks for reading!